B2B and B2C companies who target to leverage digital medium for growth. Being into software myself, it obviously helped me when I could start tracking and retargeting my anonymous leads. Snce a huge chunk pf organic leads is anonymous, Aritic PinPoint helped me segment these leads, track their behaviour and source, and also retarget these with relevant ads. The features: anonymous lead tracking and ad synchronisation, have worked so well for my business. Add to this, I am now running multiple campaigns across multiple channels. I mostly require social networking, emails and push campaigns. Aritic PinPoint's integration with Zapier has benefitted me largely. Other integrations are also on-spot. Cons: What do you dislike? I think Aritic Pinpoint is brushing up each and every feature really fast. I loved this software from the start. It has been an easy implementation and onboarding. Support team has been cooperative. Sometimes there are minor glitches in viewing reports of drip email campaigns. Otherwise it is great. Aritic PinPoint is an amalgamation of inbound practices and marketing automation. It has a wide range of features. Overall: Previously we are facing issues with Lead Management and Nurturing; Now, I can convert my anonymous visitors into potential leads and eventually nurture them to convert them into customers. With Aritic PinPoint, I have explored more avenues of content marketing, of doing content marketing better. With all the ready-made templates, drag and drop editors, and high-end behavior-based segmentation- I have achieved my marketing milestones pretty soon. 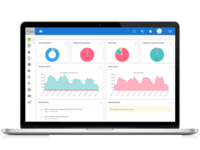 Pros: Aritic PinPoint Conversion dashboard , Awareness Dashboard and Analytics report give me exact information and specially the customer journey graph and Pivot analytics gives the exact source and customer journey mapping. Aritic PinPoint Segmentation's filters are way ahead than any other provider and best part is detailed analytics report on segment with Marketing stage funnel view and related campaign performance at single place. Cons: Some of the features which are available in Enterprise only and I need to ask them to enable it in my professional plan. It is a multiple negotiation to enable some of the features from Enterprise to Professional, but they helped me and it was done for me. Overall: Being in SAAS industry for us digital medium is key source of leads and at the same time 1 to 1 engagement with all the incoming visitors and leads. We were having tough time to understand the acquired customer source, the journey of customer within digital medium which includes external and internal. Aritic PinPoint captures complete journey of customer from anonymous visitors to converted customer, we are able to know the leads stage, and which campaign performing well to reduce the customer journey in within the funnel. Their customer journey exactly able to tell which source , which campaign, which segment performing and which one is converting my customer faster. The matrices and automated engagement helped 4 X more conversion with Aritic PinPoint. Pros: The main purpose of this product is to automate the marketing activities and with that increase the business in a systemic manner. Also they have a very supportive team. They have supported us whenever we were stacked. There are some beautiful features this product is having which we are using the most. Like lead scoring, on-site widget, form action definition, Social drip. Cons: Their Social media automation needs to be improved. But they have said they have improved and implemented some new things in Social media, which will come in the upcoming release. Overall: We have purchased and using this product for increasing traffic, covert those traffic to leads and also to increase visibility in Social platforms. We are so happy to see that the traffic is increasing in last few months, once we started using this product. Also by using lead scoring, we are able to do segmentation of leads with ease and efficiently. Pros: The Identical leads feature always report us about the lead which can get closed and we have seen the sudden jump of 40% more closure by team as they work only on the leads which can be get closed faster. The application webhook and Lead score triggers, it is something like marketing team always on work. The approach of the team after sales is very good, we are completely new in marketing automation and the team of Aritic PinPoint has taken us from basics. We have taken a lot of time and they never given-up on same. Cons: The huge list of application feature and we are not able to use till now. So need third party implementer to help us. If it can be done internally would be great. Overall: We have a huge sales team as due to pharmaceuticals domain with respect to marketing team.We need an application, which can increase the productivity of marketing team to match the sales team. The application's identical leads feature and integration of CRM helped a lot. The application's lead score based trigger reduce their time. Now marketing team focus on creative and communication managed by the automation feature and among those - Automation drip campaign and Automation social campaign. The sales ready leads coming to sales got increase by 40% and this is very great for us. Aritic PinPoint is indeed an operating system for the advanced Marketers! Pros: ritic PinPoint is one of a permissive Marketing Automation Tool I have used! It has a simple and smooth user interface. I loved the advanced segmentation feature that allows me to segment the leads with their behavior pattern and associate suitable trigger pointers on them (Lead Scoring). Cons: Honestly, I hate nothing about Aritic PinPoint. There's room for an improvement in the integrations part with other software solutions, and the Reporting section needs a little more visual detailing in the arrangement of the data. Pros: I am using Aritic PinPoint for various roles for over 8 months now. I mostly engage in managing our blog, manage campaigns, track campaign engagements, and do detailed report-digging to improve our campaigns. Also, my major focus lies in increasing the brand visibility across all marketing channels. Aritic PinPoint has been a great assistance in all these months. 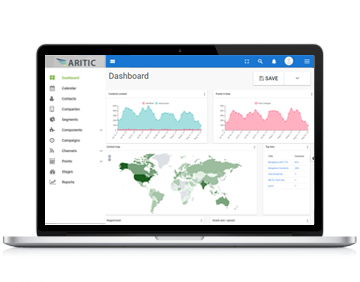 Starting with SEO monitoring and competitor analysis to proper content management, from multichannel marketing to detailed analytics and reports, Aritic PinPoint has everything placed at an easy access. I never had any navigation issues since the FAQs are nicely written, and the tool is otherwise quite organized. I love their segment filters which has helped us in creating numerous minute segmentations for our contact base. That in-turn has helped in doing relevant marketing. The fun part is, everything is easily understood and you can actually create and publish a complete automation campaign in a few minutes. Cons: Not the right choice of tool if you have zero customers or have just started acquiring customers. I think it is important to check their starting customer number on their pricing page. Overall: Try Aritic PinPoint to double your existing conversion rates. 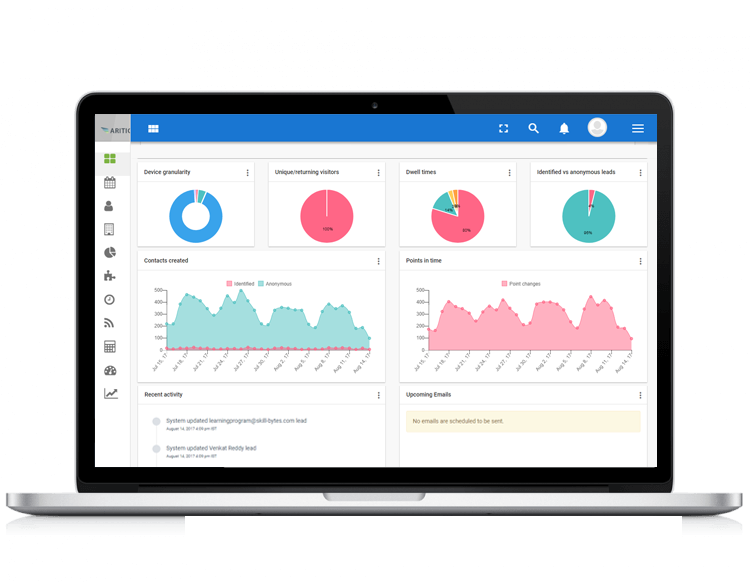 Pros: What Marketing Automation solution do you use?I work for a digital Marketing agency, and I particularly liked the lead management feature in Aritic PinPoint. Since we started using this software, segmentation has become so easy and also it gives us the privilege of handling all our marketing assets, marketing analytics, Social media pages, and Email Marketing to name a few, under a single roof. Cons: The current reports are good, but sometimes the graph pointers are not very clear, especially when I am trying to track anonymous visitors.I feel like application should develop in SEO reports so that Digital Marketing Agencies can make use of it effectively. Overall: We used to face a lot of problems with identifying the right prospects for our business. After implementing Aritic, multiple segmentation options has helped us send the right prospect to the sales team. This has also reduced the time period in the sales cycle. Pros: Aritic Pinoint has got me almost all the features which can be used for digital marketing team in an environment where we keep on organizing all the marketing related tasks on google docs and sheets. So, having integrated webinar feature is helping our marketing team deliver smooth webinar to the target customer group. Cons: Little bit slow sometimes; but I could see the team has improved the application a lot in last 2 years. Overall: Saving a lot of time and investing the same on good customers to build healthy relationship. Pros: Setup and ease of use. During setup, they will respond you on every minute and your emails will be shown as delivered in your trial period. Once you upgraded on the paid service, then the real game begins. Cons: Low level customer service. Their executives don't have any knowledge about the product. They will have a same response line (we are looking into this matter), wait time of 15-20 minutes. Even if you are raising a support ticket, they will answer after 4-5 days and with wrong information. Then they will send you an apology and it will marked as resolved. Means you are still looking for the solutions. Suppose, you sent an email to abc@xyz.com and it will marked as delivered in Aritic dashboard. Now, after that, all the emails you are sending start getting bounced. I am using gmail and in touch with same person from my gmail account but here all the emails are held and bounced. I asked them but they did not provide any solution. I lost my business as my emails were not delivered and when I tried to contact my customers, they told me that they never received any emails from my side. Then I decided to check their dashboard and surprisingly, my most of the emails were bouncing and they have no clue about that. I called their customer service number, use their chat system but no success. Overall: Never use this product. It was my bad decision that I left Constant Contact. Now, after loosing my business, I am moving again to CC and Mailchimp. Pros: I was involved in Banking system integration with Aritic PinPoint for one of the bank as we were the software vendor for Banking switch. The integration support and developer level support was just out of box.Their API documents and plugin module can integrate to any system as it was so easy for me connect with complex Banking system. Cons: I just want highlighted about cons as they are having multiple modules and it seems, the experts of those modules sits in different timezones. So some of the time, I have to aligned my team as per that. Overall: As we were only the integrator for bank so the benefits belongs to bank in communication to their members. The only benefit to us -- Now realtime data directly to bank so we were getting lesser query on ETLs. Pros: The way multi-channel campaign automation works and keeps updated the customers in the funnel with all the information about our services and the feature of webhook and trigger just keep all the software within the organization connected with the marketing and sales funnel. Cons: The initial version given to us was without RabbitMQ and Elastic search and once reported about application performance they migrated us to it. I hope, they have to provide the high-performance system to Enterprise from the 1st day. Pros: "1. SEO feature is great to maximize organic search results and for keyword research. 2. Email marketing (behavior-based, event-based) with bidirectional salesforce integration helped us a lot. 3. Easy to build and publish nice landing pages with dynamic content. 4. Progressive profiling helps in lead capturing, specially capturing marketing qualified leads. 5. Lead scoring and lead management enabled our sales and marketing team to convert a marketing qualified lead to a sales lead. 6. Improved overall team productivity. " Cons: Aritic PinPoint is not a great tool for a lean startup although they have a small plan for such companies. If you are a small startup better check their other product which is specifically designed for small companies and mide-sized startups. 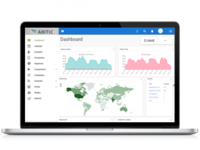 However, if you have a lot of budget and steady inflow of customers, they you can use Aritic PinPoint's advanced features. Overall: Not for small companies. Best for large enterprises and mid-sized enterprises. Pros: I got to know about this product during discussion with one of my article publisher as they were using this software from last 2 year and very happy with it and specially they talked about the support of this company. I am from health care domain and want to do increase traffic and engage my visitor and registered users. There implementation team took two days to configured the system for me and after that this just cake walk for. This gives me all the require option and feature of marketing ( including social). Very happy to use from few month. Cons: As I want to use to increase the traffic on my website but I still did not get it but visitors are getting engaged very well and got 16 folds communication with my visitors and that is great. Overall: The engagement with visitors has gone almost 16 times using this software whereas earlier I was not able to understand who all are coming to my site and not I am know them and engage them. Pros: We use Aritic PinPoint for almost all our marketing activities and campaigns. Emails, landing pages, mobile marketing, video marketing, website tracking, lead scoring, contact segmenting, contact lists, email filters, etc. Everything is available in this tool, and it is super easy to navigate through the tool. We use Salesforce CRM, and we could integrate it very easily. The bidirectional CRM sync is a great advantage. Cons: I think there is a lot of scope to incorporate more design features. The BEEFree editor and drag and drop editors are good, still I find lot of restrictions in aspects of design. Maybe more integration with other design platforms may help here. Overall: Good product. Very comprehensive and an all-rounder. Highly recommended. Pros: It was hassle free migrating to Aritic PinPoint. The features it comes with are available at a great price. Marketing, CRM, and sales - Aritic PinPoint serves all these three major verticals really well. Additionally, their knowledge base is a great support. Cons: I had a lot of trouble integrating my Salesforce account. It is such a long provess and their video tutorial was bad. I hope soon they release proper video tutorials because I think it is better to see and learn than read and learn. Overall: There are many bugs that often makes the tool slow. Otherwise a comprehensive tool. Pros: Here's what I liked about this tool. It has a free trial unlike few of its competitors. It has all the features in place, bridging the gaps created mostly by tools like Marketo or Hubspot. It is an integrated marketing automation platform. Keeping in mind the huge list of features it comes with, the pricing is at par with industry standards. Cons: The learning curve is quite steep with this product. Overall: It took me sometime to learn about the features and how to use them. Once I crossed that stage, I had a great experience with the tool.